It is difficult to explain the poverty and lack of opportunity for the people of rural India. They have few opportunities for education and employment. Many are trapped in degrading poverty for life with little hope of escape. Into these places go the people trained at Delhi Bible Institute. They go and live in these villages and bring a message of life, hope and small scale development. Bright Hope World personnel met Isaac Shaw, the leader of Delhi Bible Institute, in a number of locations and developed a relationship. We heard his story and the vision for the development work in Northern India; it is truly impressive. Early in the piece it was agreed that this was a vision worth supporting and an initial amount was sent for the support of the Ashram development and training programmes. This involved training people from rural backgrounds and sending them back to become agents of change in their communities. In 2003 the Bright Hope World leadership team visited DBI in Delhi and a strategy was developed to work together. Various sources of funding have since been developed. Most of the funding has been focused on the training and supporting the ex-students out in the field. This partnership has the potential to become a significant player in the development of Northern India, to break down the intolerance and poverty of body, mind and spirit in those areas. The beneficiaries are the people being trained, but indirectly the beneficiaries are the ones who respond to the message and the programmes they deliver. The holistic nature of the partnership and the significant change the trainees introduce to their communities. The very clear strategy that has been developed. The high calibre trainers, their qualifications and experience. The huge number of opportunities that exist. The passion of the guys in the field and the huge cost it is to them to do the work they do. Isaac is currently the Executive Director of DBI. He has been on the staff since 1983 in various positions. He was encouraged to join the ministry by the founder, Robert Duff, who trained and mentored him for 18 years. 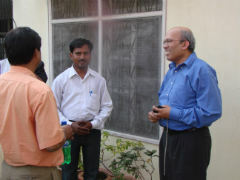 He is also the Senior Pastor of Bible Bhavan Christian Fellowship where he has been involved in leadership since 1982. 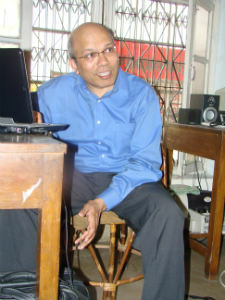 Isaac graduated with BA Honours in English Literature from the Delhi University, and later completed an MA in English Literature. He is bilingual with proficiency in English and Hindi, and has a deep love for the people of North India. He is married to Gloria Ojeda who was born in Bogotá, Colombia. She was educated in Egypt, Ireland, Lebanon and Israel. 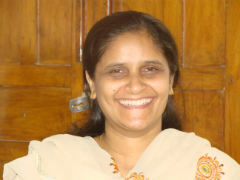 She graduated from Appalachian State University in North Carolina where she was involved with Campus Crusade for Christ. She currently leads DBI's projects helping the poor to develop the means of a sustainable income and skills training as a volunteer. Isaac and Gloria have four children, twin daughters, Gloria Raquel and Myriam Elizabeth (born 1994), Sarah (born 1997) and Isaac (born 2000). 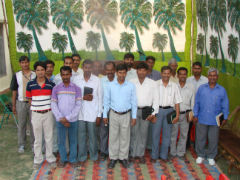 There are many other people involved helping to provide development training throughout North India. The strategy is to develop a training and development base in each of the capital cities of Northern India. There are twelve States. The training includes a range of courses, from one week short courses to one year live-on-site courses. The annual budget provided by BHW to DBI is US$18,040 - we do not fully financially support this partnership but send as much as we are able. There is great scope for further investment in this programme and they could use virtually as much as we could give them.